Computer and software are two major thingÂ inside windows xp operating system, computer cannot running without sofware and software cannot running with computer. Many computer user having problem with computer or software doesnt respond when they want to use a computer.Â All computer user having this issue i think porblem with computer and software, one minute your computer is working fine. The next minute, everything freezes.Â Windows, your software, and your mouse donâ€™t respond to your commands.Â If you are a regular user of Windows operating system, this scenario has probably happened to you more than once i surely.Â The next time it does, follow below tutorial if your computer or software doesn’t respond. Hope user can understand step by step if computer or software doesn’t respond. What user need to do when computer or software doesnt respond? 1. Wait a minute because your computer may just be experiencing a temporary freeze (which can happen if you try to open or run several programs at once). 2. 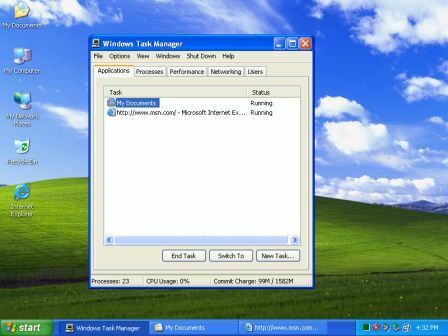 Open the Windows Task Manager by simultaneously pressing the Ctrl, Alt, and Delete keys on your keyboard or right click computer mouse at taskbar and find task manager. If around 30 seconds have elapsed and the Task Manager has not opened, proceed to Step 5. 3. When the Task Manager opens, click the Applications tab. 4. If the Task Manager indicates that a particular task or program is not responding, click its name, and then click the End Task button.Â If a window pops up and asks whether you want to end the task or program,click the End Task button again. 5. If the troubled task or program continues to be unresponsive or if your computer as a whole is experiencing problems, save any open documents (if you can), and then turn off your computer by pushing or holding down the power button on the front of your computer. Next, restart the computer.